Seems us Samsung folk (I’m really beginning to regret leaving HTC) are still experiencing issues with the pre-NoDO update (take 2). Pulling the original release, this second attempt was meant to have fixed the teething issues, but alas there are still problems being reported. I’m just grateful we haven’t gone down the Windows Vista/7 route with displaying a notification that we have 130 updates available. damiao_jr on Twitter has voiced more concern over the updating (through Zune) with attaching the error code that is displayed. WindowsPhoneSupport replied to the tweet with a snappy statement “we are looking into it right now”. 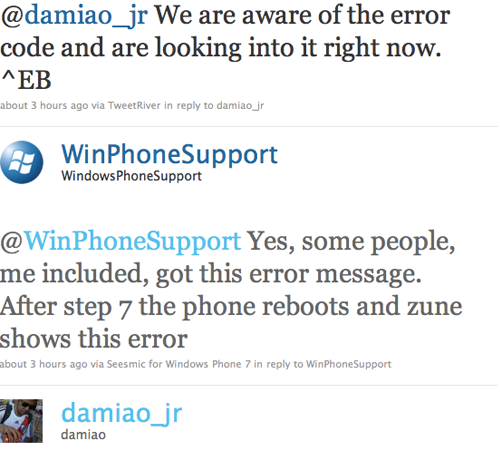 Unfortunately, this isn’t an isolated incident, and I truly feel for the WP7 development team right now with the serious run of problems that have been present with the first update. I - myself - gave the update another attempt today after the miserable attempt previously when the pre-NoDo update was first pushed out. When I tried to update my Samsung Omnia 7 device the first time round it simply failed at the backup stage, and would just freeze until unplugged. The device remained unaffected, however, and strangely alerted me to the update being available every time we tried and failed - I gave my phone credit for being optimistic. Today was an entirely different story. The update process (running the Windows Phone Connector on OS X) managed to pass through the backup stage, but all hell broke loose afterwards. Upon restarting my device and pushing the update via the cable, an error dialogue appeared stating the update failed and that a backup will now be restored. I thought “ah well, I tried and failed, at least the backup will roll me back before I ran the process”, boy was I wrong. Instead, I received the message pop-up “the backup could not be restored”, and from that moment onwards the Windows Phone Connector software and my device remained dormant, frozen and non-responsive. Rebooting my device after unplugging it from my MacBook only brought it to the ‘please connect me to your computer’ screen, which would loop the entire process resulting in continuous fail. Stuck at a wall, the only way to sort this issue out and break the loop was to hard-reset my phone, re-plug it into my laptop and have it return to factory defaults. It meant I have a working device I spent over £400 on, but with absolutely everything lost (contacts, music, apps, photos, saved games etc.). All in all, it was amusing reinstalling all my applications and games. Are any of you experiencing issues with the update still?